If you're anything like me, you love having a lovely home and garden. 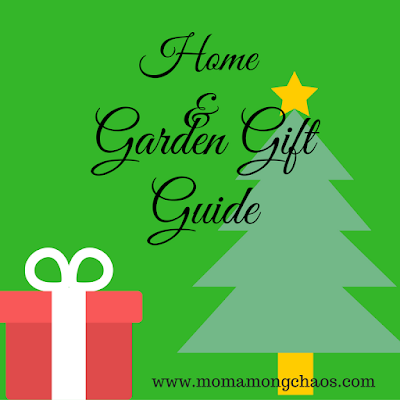 So, I've come up with a Home and Garden Gift Guide with a little something for everyone on your list! The kind folks over at Toilettree Products sent me this beautiful bamboo garbage can. I had been looking for something unique to go in my basement bathroom, and this was just it. My husband put it together for me and commented how well made and cute it was. It is small, but it works out perfectly for our basement bathroom that doesn't have high traffic. Toilettree Products have a full line of bamboo products that are simply gorgeous. Go check them out! I love this key rack mail organizer. It's cute and handy. No more lost keys or misplaced mail. It comes in five different colors to choose from to match your decor perfectly. Key rack features five hooks. This item is super affordable! This wooden hanging jewelry organizer is not only chic but ideal for organizing your everyday jewelry! I typically wear the same jewelry unless it's a special occasion so this is perfect for grab and go. Handcrafted in the USA! This wicker storage basket is perfect for storing your furry friend's toys. I have bunches of wicker baskets in my house for storage. It not only keeps things organized but they're also stylish. This white wooden window pane is unique and stylish. I love that it looks a bit weathered. This pane has a shabby chic feel to it.